May Sun is a Los Angeles based artist working in Sculpture, Multi-Media Installation and Photography, Drawing and Painting. Her work has been exhibited nationally and internationally, including MIT’s List Center for the Visual Arts, ArtPace in San Antonio, Texas and the Asia Society Galleries in New York. In her public art commissions, she strives to bring to light untold histories of the site that honor communities in works that are aesthetically powerful and meaningful to viewers. Her choice of material is based on the surrounding environment and its appropriateness in the narrative of the artwork. 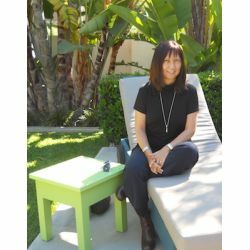 She has won numerous awards and fellowships, including two NEA Visual Artist’s Fellowships, a Getty Fellowship for the Visual Arts, an AIA Certificate of Recognition Award, and an Honor Award from the Los Angeles Westside Urban Forum. Her installation UnderGround is in the permanent collection of the Museum of Contemporary Art, Los Angeles. Her multi-media installation “L.A./River/China/Town” premiered at the Santa Monica Museum of Art’s Art in the Raw series in 1988, and the MOCA produced a radio version of the installation won a Silver Award from the Corporation for Public Broadcasting. She received her B.A. in Art (Painting/Sculpture/Graphic Arts) from UCLA and attended the MFA program in Sculpture at Otis Art Institute, Los Angeles. Teaching experience includes several years as a faculty member at California Institute for the Arts, and a visiting artist and faculty member at art schools and colleges nationally, including the Rinehart School of Sculpture at the Maryland Institute College of Art in Baltimore, Maryland.